I know nuthin' 'bout picking the perfect pumpkin. But somehow, the perfect pumpkin always seems to pick me. 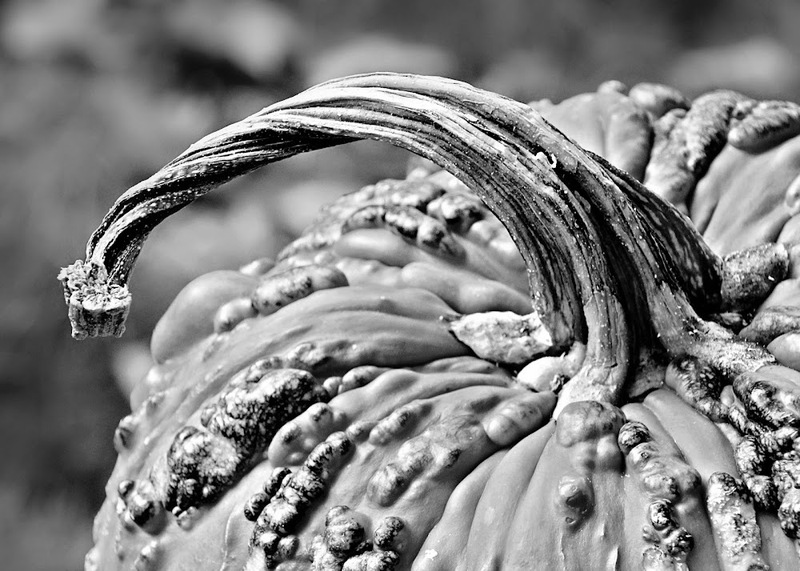 There are some things in nature that are a vision to behold - pumpkins are one of them. Short and round, with warts and stubby vines, with any number of textural imperfections - they are none-the-less beautiful. Creative and very textural ~ wonderful BW photo! Beautiful shot, Kath! I have pumpkin love. Love that stem and the texture! I'm sayin exactly what Heather above me said. What an interesting looking pumpkin! Love the texture in b&w. Very cool! Love the warty ones best, too! Lovely stem ... that is always the way I pick pumpkins for the front of our house. Nice choice of b/w format. Great texture! The ones with all the bumps and interesting stems are the ones with the most character!